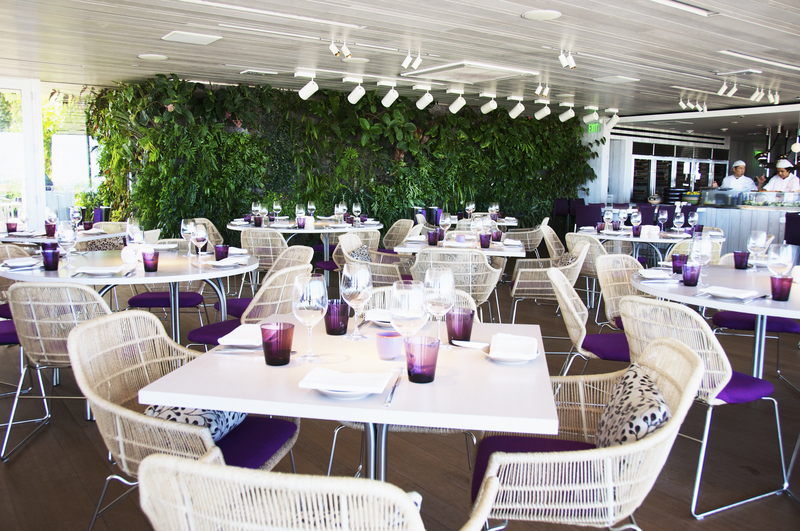 Juvia is not an ordinary spot as it is situated on the top of a building that offers a panoramic view of Miami Beach. This breezy location serves up a fusion of Japanese, French and Peruvian cuisine that offers flavors that are far from shy. The elevator on the ground floor gave no indication as to what awaited at the top: a luxurious, beautiful restaurant with an assertive injection of purple-amethyst notes as part of the color scheme and a magical wind that at times was soothing, and other times just plain ice-cold. Upon arrival, we were offered shawls to shield us from the wind that obviously can get strong enough to warrant this; a nice touch. The menu offered a great variety of dishes so we asked our waiter, Daniel, to choose for us. To begin with The Juvia Lemonade and Mojito were the choices. 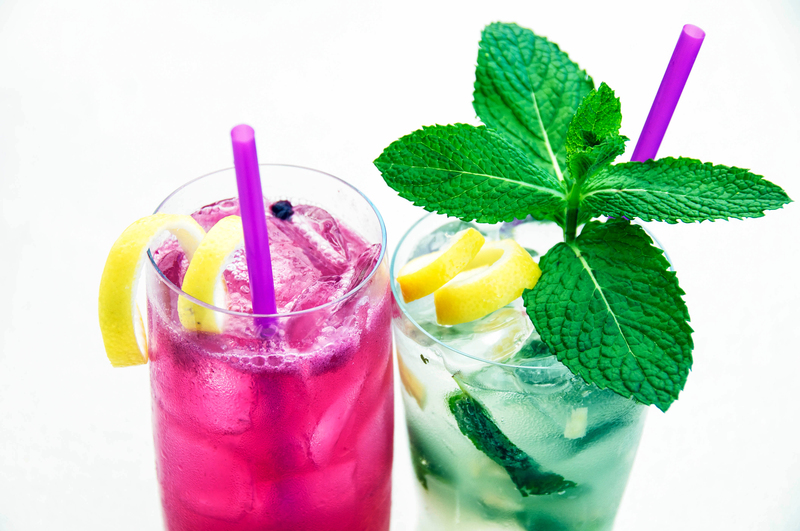 The drinks were colorful and refreshing; non-alcoholic versions were also available. 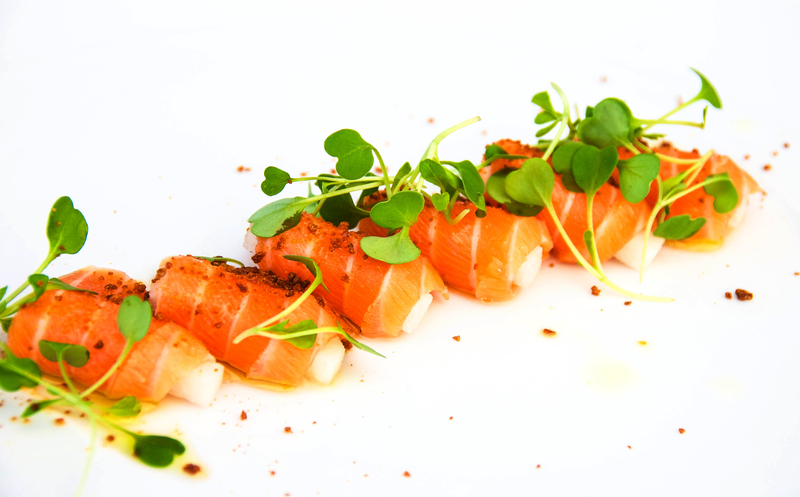 The next dish was the Salmon Nashi that was made with truffle oil, dry miso and micro arugula. This was some good-looking stuff. The salmon was fresh, the truffle oil adding a dash of extravagance and the arugula a crunchy green note. 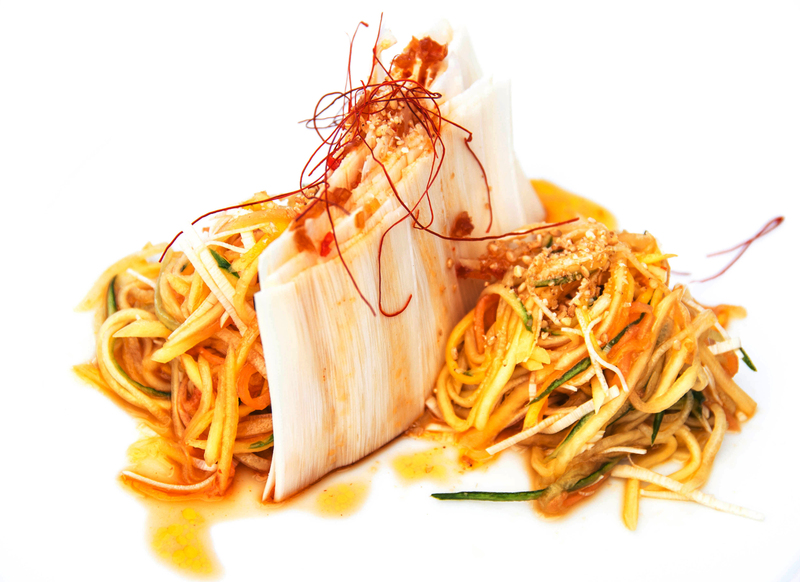 The Hawaiian Hearts of Palm was accompanied by green mango, green papaya and cucumber. This plate was luxuriously delicious, the hearts of palm served in big sheets as opposed to chunks thus exposing their flavor in a really great way. 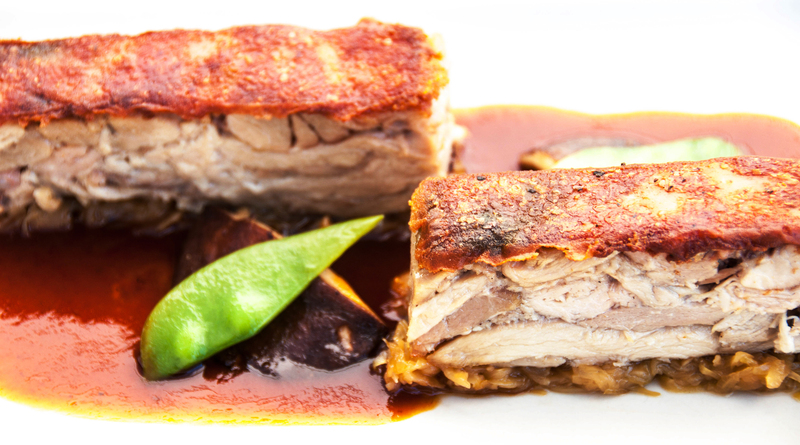 Milk-Fed Pork Confit was a magical combination of shitake, sour cabbage served with a ginger-honey glaze. This was nothing short of succulent, the crunchy exterior enveloping the soft, moist pork and delivering an absolutely divine package of goodness. Rock Shrimp Tiradito made with aji amarillo aioli, red onion and cilantro was redolent with aromas from Peru. Tiradito is a Peruvian dish of raw fish, similar to sashimi and carpaccio. From the Cold Bar we indulged in a massive platter of Oysters. 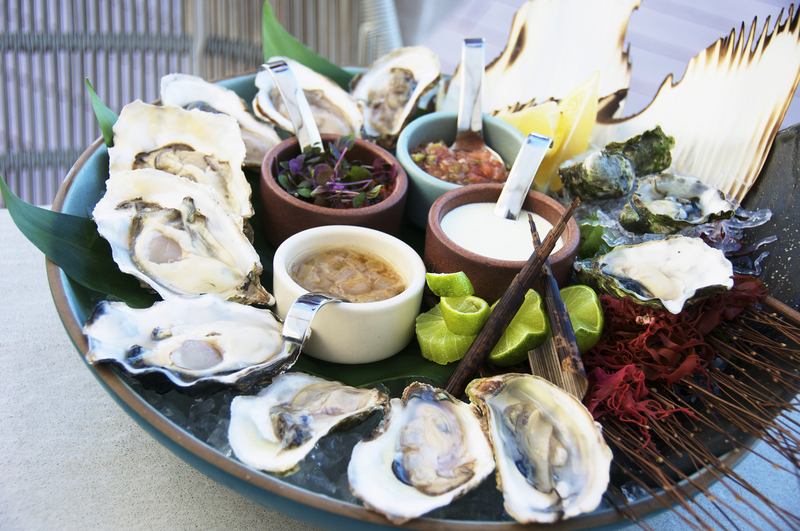 This particular tray included four different types of oysters (Kumamoto, Malpeque, Beau Soleil and Maple Point) and four sauces. There are several options of sauces: Caramelized onion soy, Red onion shiso, Aji amarillo aioli, Creamy yuzu, Tosazu, Wasabi cocktail, Mustard vinaigrette and Yuzu soy. What an amazing looking plate: it was dressed up like if it was going to a party, tasting of pure ocean and providing a flavor both serene and explosive. As a first main, we ordered the Seared Tuna with Caramelized Onions and White Soy, which was an interesting composition because it came with an avocado and heirloom tomato salad and jasmine rice. It tasted really great but it was not a pretty dish. The beautiful tuna adorned with micro-greens lost its luster when served alongside the plain-looking salad and the rice. 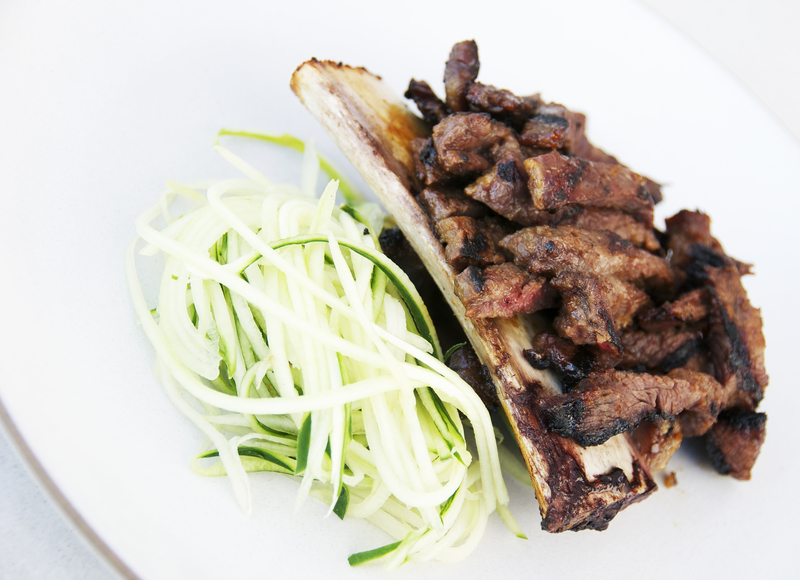 We ordered the Korean Marinated Short Rib from the Binchōtan Charcoal Grill. Binchōtan or white charcoal is a traditional charcoal of Japan. Because it does not release smoke or other unpleasant odours, it is a favorite of chefs around the world. These ribs were crazy-wonderful with a dark and comfortable flavor that was just heavenly. There were nicely done with a combination of spices and a light char around the edges that added extra texture and depth of flavor. 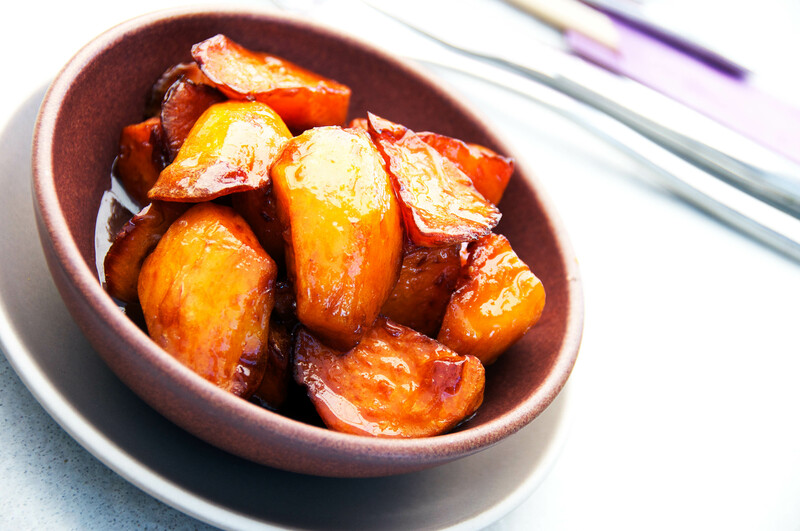 As a side, we devoured the Candied Sweet Potatoes which were so sweet that they almost tasted like candy. Brilliantly orange in color with a golden glaze, this was a dish that is sure to delight. For dessert we had the Key Lime Pie, which was actually a de-constructed version. It was made of shortbread crumble and meringue fingers. It was delightful. Juvia offers a variety of yummy desserts that includes Cheesecake with roasted strawberries, Chocolate Candy Bar, Roasted Pineapple served with brown butter ice cream and the unusual “Juvia Shot “ which is warm coconut and cold piña colada among other choices. 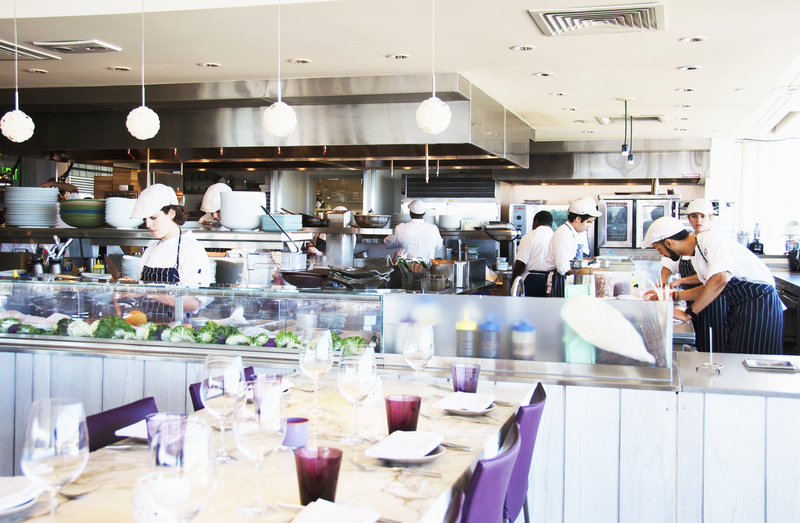 Juvia is a “culinary collaborative” comprised of a group of chefs and restaurateurs who work together to create a unique dining experience. We got to meet Executive Chef Sunny Oh, who was born in Seoul, South Korea, and came to Florida at the age of 5. 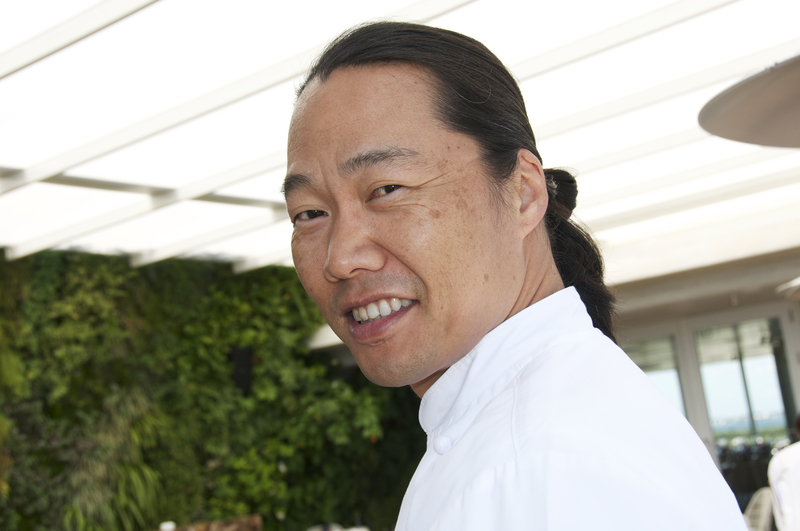 He has over 20 years of experience in the restaurant business and showcases raw and cooked fish specialties imbued with Asian tastes and ingredients. He also happens to have a wonderful smile that is contagious. 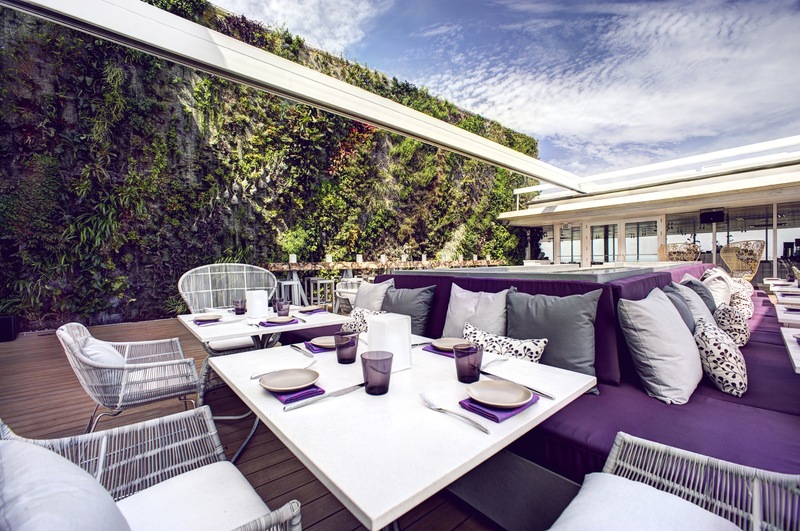 This 10,000 square foot penthouse rooftop restaurant radiates a radical energy at night when the vibe is more lounge-like and hip. Prices are on the high side unless you go for lunch and order one of their Bento Boxes for $23 so reserve Juvia for an occasion that deserves commemorating and celebrating. Your photography and new website is outstanding, Brenda, beautiful work, congratulations! Brenda – this is OUTSTANDING! LOVELY photos and write-up! Great photos! I’ve been wanting to stop by there and now I can’t wait! Thank you for the compliments. It is a great place to visit, different for sure. sites? I have a blog centered on the same information you discuss and would really like to have you share some stories/information.